After 30 years, my Craftsman 3 ton floor jack finally took a dump on me. It was indeed a sad moment as that was one of my first purchases as I started working on my own cars. 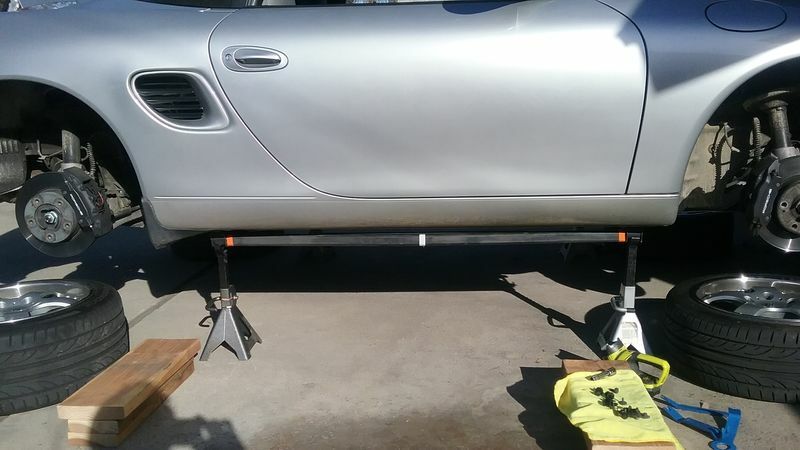 I am looking for a new 3 ton floor jack that will fit underneath my 986 and the liftbars that I purchased for it a while back. Any recommendations? the recommended jack on some forums is the DK13HLQ, max height around 28 inches and around 550 bucks. I'm convinced this is a really nice jack, but I couldn't come off the coin. You need the long reach one, but they delivered it and it works great for my cars. Low enough to reach under and 25 inches of lift with my hockey puck on it. It does the job well and I've been very happy. Mine is green, but there are some other colors too, if you care about those things. Agreed, HB has helped the budget minded, if your careful what you buy. I have a retail store 10 minutes away (lucky me) so shipping costs for stuff not stocked isn't an issue either. Because the jack you have is 30 years old it was built when quality meant something .......... hence it lasted 30 years . You should be able to either rebuild it yourself or have it rebuilt by a hydraulic shop . You get to save the memories , keep an item out of the landfill and have a quality piece for another 30 years . Plenty of You tube videos out there explaining the rebuild process . ....I own one of the old aluminum rapid pump 1.5 ton Harnor Freight jacks that only weighs 35 pounds and lifts to 18 1/2 inches. But, they don’t make that one any more. I have this jack at my home, and we have 4 more of them here at the dealership I work at. For the price it works great, it fit under my race Miata, and my lowered Mustang without issues. +986 on this jack. I have three of them. One at home in the garage, one in my shop and a third under the rear seat of my truck. Well worth the money. They'll slide underneath my Boxsters and they'll easily lift my 3/4 ton 4x4 Chevy 2500HD. I want to do this now, but this floor jack will not fit under the car with the liftbars, so it's a process to use them, so I think it would be best to buy a new one. However, I'm going to look into rebuilding this one too as it has served me well for a long time. I'm sure I can find a use for it other than chucking it on the junk pile. This would be my next floor jack. Decent price, very low profile, high lift. Or, I might just go crazy and install a lift of some sort. Enough lift to allow an engine drop on the 911. High quality for a great price,speaking from experience. Pick up in store. And then there's the QuickJack! No more jack stands! I have yet to find a jack, with a low enough profile, to get under the liftbars. In stock ground clearance, suspension/tire size at 4.1" (IIRC), the jack would need to be just under 2" tall. I have never seen one that low. I have a set of liftbars and really like them. I made up some 2X8 spacers to set the car on first and then have enough room to get under the liftbars. The car is very solid on them. Yep, and in orange, best color. You will be pleased, I think. Double check everything when you get it, make sure no leaks etc. the bleeder screw on mine was loose, no big deal.